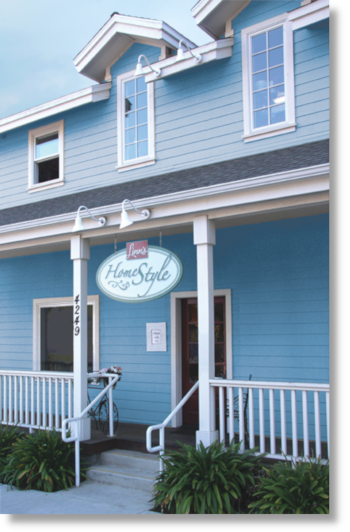 Open daily from 10am - 7pm weekdays, 8pm Fridays and Saturdays, 1-805-924-3050. Casual retro café and take-out with a family and dog-friendly garden patio. Meals that are easy to order, easy to afford, and easy to love! 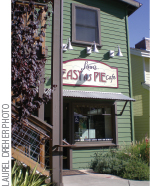 That's what makes Linn's Easy-as-Pie Café special. Stop in for delicious sandwiches, pot pies, salads, soups, a slice of fruit pie, fresh baked goods and desserts. Pick up Linn's fresh-baked pies to take home! Open daily from 9am - 6pm. 1-805-924-1064. Shop for your favorite Linn's packaged foods, gift crates and baskets. 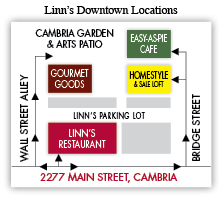 Here's where you'll find all Linn's packaged comfort foods to enjoy during your visit to Cambria or to take home with you including many of the sauces, we serve at Linn's Restaurant and Easy as Pie Cafe. Find your favor Linn's Fruit Preserves, Frozen Ready-to-Bake Pies, Pancake and other Baking Mixes, Syrups, Fruit Teas, candies, snacks, and more. You can select from a wide assortment of frozen pies, gift baskets, or preserve crates for nationwide shipment from Cambria. Gourmet Goods also has an extensive selection of kitchen linens, utensils, ceramics, and gifts for the cook. Come in and browse to your heart's content. Open daily from 10am - 6pm. 1-805-927-5717. Women, children, gifts, books, bargains galore! Fine gifts for women and children including clothing, hats, handbags, jewelry, shoes, scarves and good reads fill the first floor of this charming Victorian building. Upstairs, Linn's Has Bin sale loft is home to treasures on sale every day! Open currently Saturday and Sunday from 10am - 5pm 1-805-927-8134. (Reopens seven days a week mid-March). Enjoy fruit pie and a cool drink in the shade! 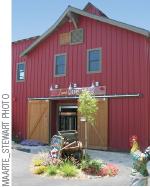 Visit Linn's California central coast farm where it all began. Situated in a valley of pristine beauty ten minutes east of downtown Cambria on Santa Rosa Creek Road, you'll love this meandering country back road. Sit under the sycamores and enjoy fruit pie and a cool drink. Linn's packaged foods and gifts are available. 6275 Santa Rosa Creek Road. Open daily from 10am - 5pm (subject to change seasonally). Starting at Linn's Restaurant, go south (toward SLO) on Main Street about 1/2 mile and turn left onto Santa Rosa Creek Road. Drive past the high school and continue for a meandering 10 minutes. The Linn's Fruit Bin Farmstore entrance is on the right side of Santa Rosa Creek Road. Some products are subject to seasonal availability. Linn's is not responsible for out-of-stock items. We recommend contacting the store nearest you by phone for available inventory. We make every effort to keep this list current but are not responsible for out-of-date contact information or participating store revisions. Contact Linn's at 1-805-927-1499 for the most up-to-date information.